The colors are a bit muted, but that’s what happens when you take a walk in the evening. Still, I like this photo for the calm nature of the scene. 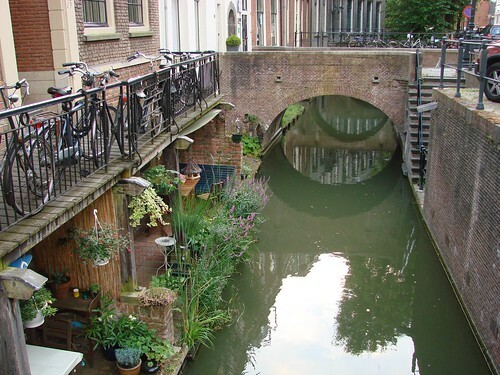 I love all the little canals you stumble across here in town, the ones that have these little vignettes of day-to-day life. There’s something about this terrace that makes me think of Daytona Beach. Maybe it’s the sense of casual life lived outdoors. It’s not decorated straight out of a catalog; it’s comfortable and homey. I also just really love small bridge reflections in water. 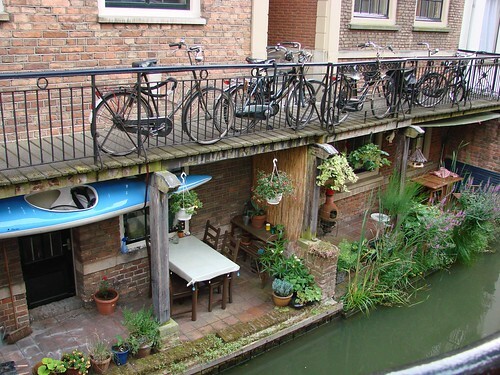 Here’s a better shot to show how the little wharf terrace is decorated, with bonus kayak. 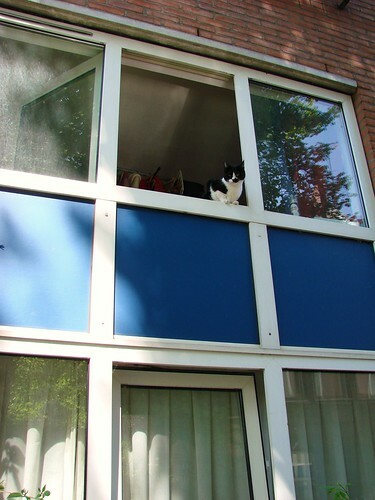 The weather has turned lovely and everyone is enjoying it, throwing open windows, sitting outdoors, and just generally living the gezellig life. Even I’m feeling more like myself again, even if I do get easily tired. To make the most of the good weather and my return to health, G and I headed out this morning to hit up a few shops on Nachtegaalstraat. I had my camera with me, of course and took a few shots along the way. I figured I’d share some of the photos I took today that seemed to embody the spirit of the day. 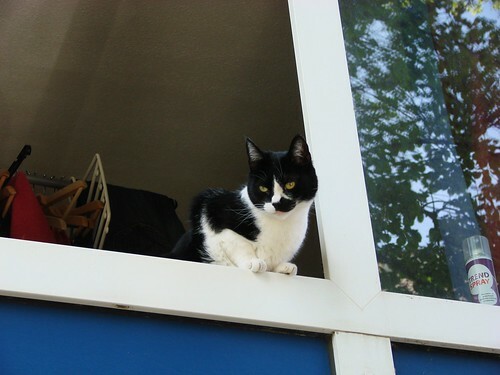 As you can see from the first photo, even the neighborhood cats were enjoying the spring weather and the open windows! 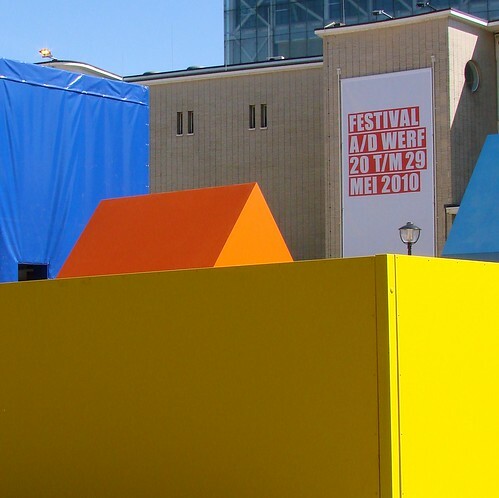 The annual Festival aan de Werf is going on this week and the area in front of the stadsschouwburg (city theater) has been taken over by a colorful part of the festival. 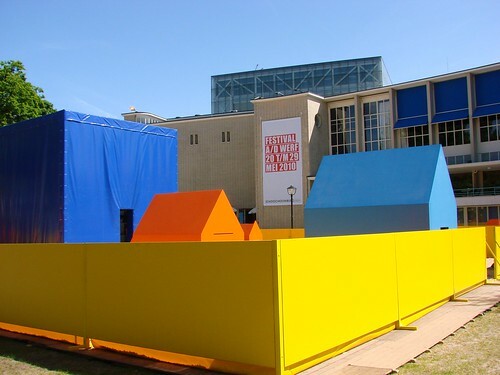 I loved the geometric shapes, simple colors, and bright sunshine. Unfortunately, by the time I got to that point, I was already feeling a bit wiped out. In my head I could envision the type of photo I wanted to get, focusing tightly on the shapes, but my mind just wasn’t moving quickly enough. I guess that’s the result of only really having two meals in three days. Still, with a bit of cropping, I got something close to what I had in mind. Fortunately, I’ve got the rest of the week to try again. Even our own animals couldn’t resist the siren song of the sunlight. 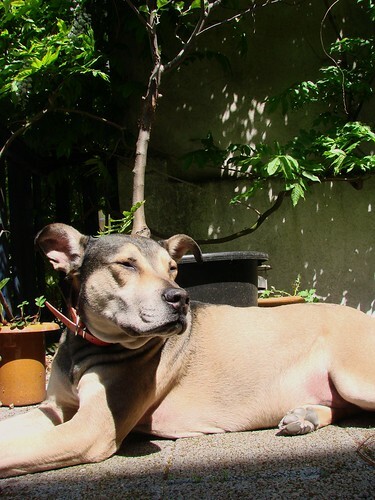 Pippo made a beeline for the terrace when we got home and started sunning himself under the apple tree. It’s a dog’s life! Tomorrow or Monday — Eerste and Tweede Pinksterdag (a two-day celebration of the Pentacost, and national holidays here) — I’ll be going over to the Griftpark to check out this year’s Utrechtse Fabriek, an indie craft show. I went last year and got to meet Nina from ninainvorm, who makes lovely pottery, including a piece I have. This year I’ll definitely be going to check out the work of fellow Utrecht-resident Kerry, of solohandmade. Even if you don’t get to go to the show, check out her website. She makes beautiful stuff!